The black Tote Portfolio Case for iPad 2nd, 3rd, 4th Gen from XUMA combines style, functionality, protection and accessibility in one compact package. The matte finished portfolio not only protects the front and rear of your iPad from dust and dirt but also comes with a built-in magnetic cover that activates your iPad's Sleep/Wake functions. Two magnetic handles provide you with ease of transportation while the slip-in design securely holds your iPad in place with a firm touch fastened tab. The soft interior lining is designed to be especially gentle on the iPad's screen and finish. In addition to protection, the portfolio folds into a very handy 4-position working stand for easier viewing, typing or game playing. No matter how you use the Tote Portfolio, it always gives you full access to all your ports, buttons, controls as well as front and rear cameras. The entire portfolio is secured with an additional magnet for firm closure. 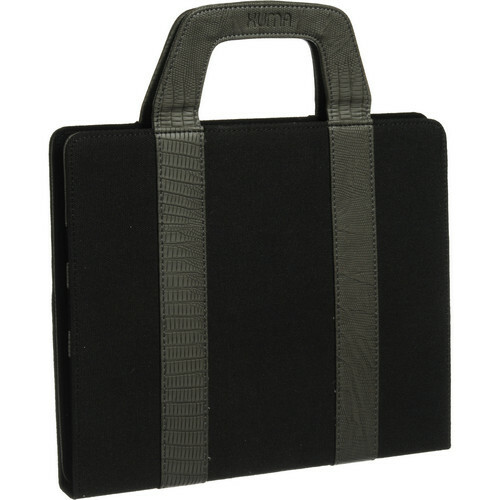 The Tote Portfolio Case for iPad 2nd, 3rd, 4th Gen is backed by a one-year limited warranty from XUMA. Box Dimensions (LxWxH) 10.6 x 8.6 x 1.6"
Tote Portfolio Case for iPad 2nd, 3rd, 4th Gen (Black) is rated 3.3 out of 5 by 3. Rated 1 out of 5 by Serious ios and android user from iPad 3rd Gen sizing misfit Product looked great. iPad snugly fit into case. However when attempting to close the case it was improperly stitched or designed wrong so that the case and magnetic handles did not keep closed. Consequently the iPad remained on and drained battery. Multiple attempts to re-seat the iPad into the case proved fruitless. Thus returned back to B&H. Rated 5 out of 5 by careful.shopper from does its job For the price, this is a very good case. It offers protection, which is why I bought it. I like that it has a handle, although it doesn't appear to be magnetic, as described. I simply use a velcro strap to hold it closed. Rated 4 out of 5 by Andrew from Include Instructions Would have been nice to include instructions showing that there is a strip of Velcro to pull back in order to insert the iPad. Does this item fit an iPad Pro? Asked by: Marray Jaritane N.
The Xuma Tote Portfolio Case will fit the smaller 9.7 iPad Pro very well. It will not fit the larger 12.9 model.